The Breakingviews Abenomics Index rose to a 12-year high in May. Although consumption fell for a second month following a sales tax increase in April, stock prices recovered and inflation expectations firmed up. A jump in wages is now crucial for consumer spending to revive. 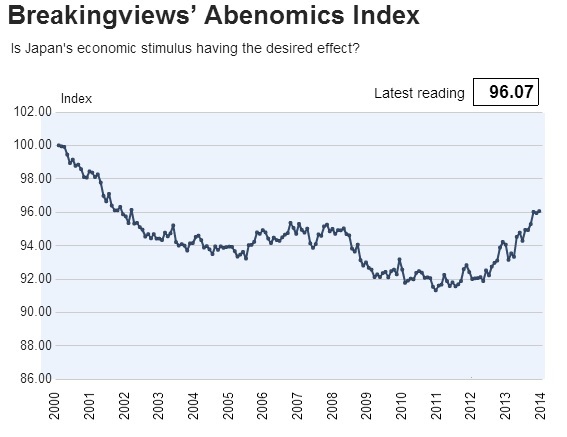 The Breakingviews Abenomics Index rose to 96.07 in May, its highest level since March 2002. Among its 10 components, rising consumer prices led the recovery in the index from its April value of 95.95. Inflation expectations firmed up, and the current account surplus widened. Stock and bond prices recovered. Private consumption, wages, manufacturing production, bank lending and new housing starts were weaker than in April.